The pedometer bracelet by LETSCOM is not only a functional fitness tracker but also a fashionable watch with a heart rate monitor included. The time can be easily read by turning the wrist back and forth quickly. The set-up is pretty straight forward via the free VeryFitPro app, which is available for Android and iOS. 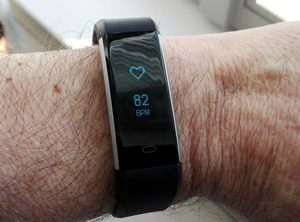 For this purpose, a Bluetooth connection is established between the smartphone and the activity tracker. You only need to enter age, gender, height and weight in the app in order to set the activity tracker up initially. Then the device is ready to use and the current time is displayed. Based on this information, the step length and thus the daily distance as well as the calorie consumption are calculated. 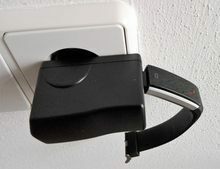 The LETSCOM pedometer bracelet can also be used without Bluetooth. Only for the initial set-up the App VeryFitPro is required on your smartphone. 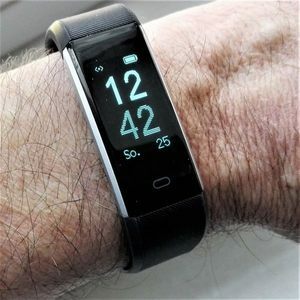 Once this is done the fitness bracelet can be used without the app and Bluetooth connection, if you don’t need any further analysis of your performance over time. By default, athletic activities such as walking, running and cycling can be recorded separately from daily activities for a sporting activity. All you have to do is press “Start” at the beginning of the activity and stop once your done. Other sports such as soccer, running, cycling, hiking, mountaineering, badminton, fitness, dynam. Biking, treadmill, yoga, basketball, tennis, dancing can be added via the App. All the data on the device is automatically reset to 0 at midnight. If you like to review your performance over time, you need to synchronize your data daily with the VeryFitPro App. The synchronization is automatic. As soon as you have activated Bluetooth on your smartphone, the tracker is recognized and the data is synchronized. It is important to first activate Bluetooth on the smartphone and then open the app. Then it works automatically. The LETSCOM Fitness Bracelet is a solid pedometer bracelet with precise pedometer, a good to go heart rate monitor and event tracker. It works also as a stylish watch. Very reliable and accurate tracker for a budget! However, it should be noted, that it is just too wide for narrow female wrists. From our perspective not suitable for women or children!